I’ve been obsessed with horses since I was a child. I started riding horses when I was nine, evolving into a hunter/jumper rider and then dressage. I exercised racehorses in college and had visions of becoming a horse veterinarian. I followed horse racing, getting a subscription to The Blood Horse magazine and watching races on television. During middle and high school, I picked the Kentucky Derby winner six out of seven years. Things changed as ‘life happened.’ I was forced to stop riding due to a surgery that replaced my femur and knee with titanium. I switched from pre-vet to journalism in college. And my attention wandered from racing. But the obsession with horses never wavered. When my husband suggested a stop at Kentucky Horse Park in Lexington on our way home from Florida, I jumped at it. Then he suggested we fulfill my interest in touring some of the horse farms made famous by racehorses and breeding. I was ecstatic. 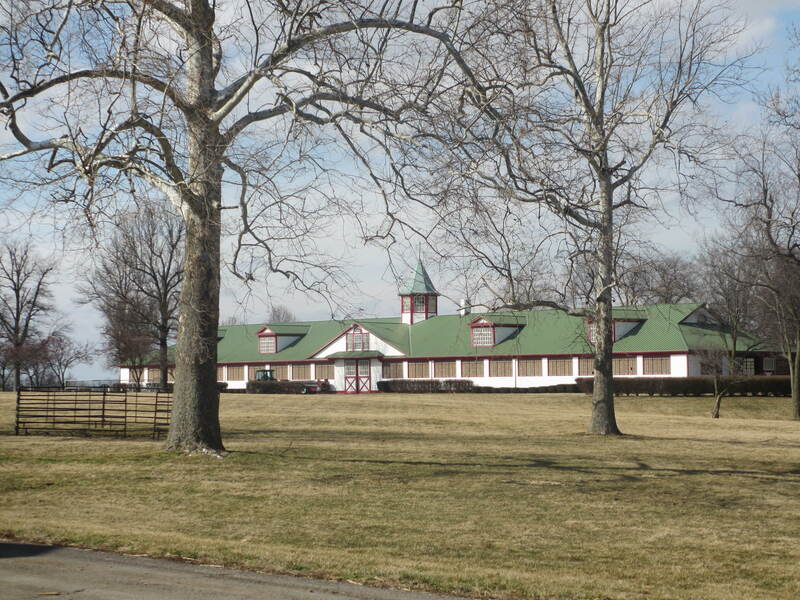 Kentucky Horse Park has a partnership with Unique Horse Farm Tours, which provides tours to three big racing farms. As we waited for the tour bus to arrive, my excitement climbed. I kept hugging my husband, assuring him he would ‘love’ it too (ok, maybe he didn’t love it like me, but in the end I think he found it really interesting and learned a ton!). 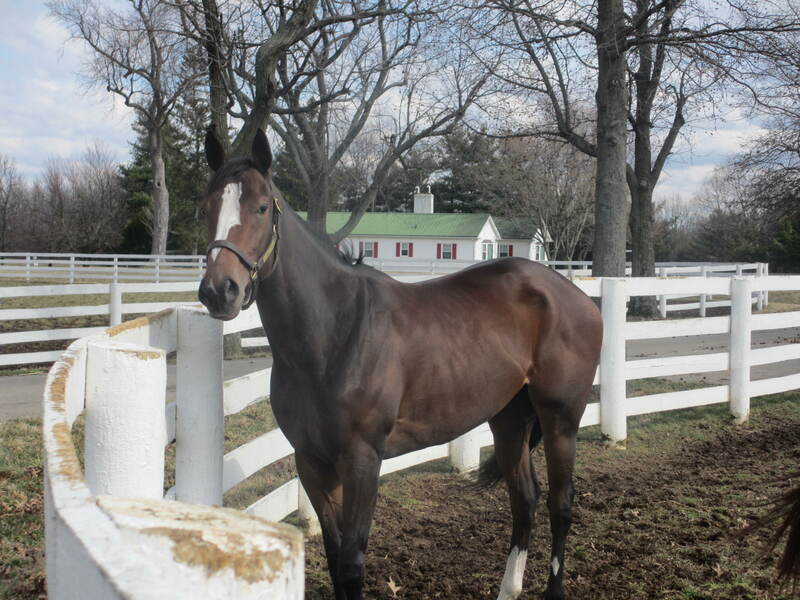 around horses and owned racehorses for years so we enjoyed talking with him. He started the tour with some racing trivia – I blurted out the answers to every question, then decided to be quiet so others could answer. But no one else did so Shaun and I became fast friends! Justin and I asked lots of questions throughout the day too, which Shaun seemed to love. If you’ve been to or even just driven through Kentucky, you’ve seen the rolling black or white fences that line acres of horse farms. 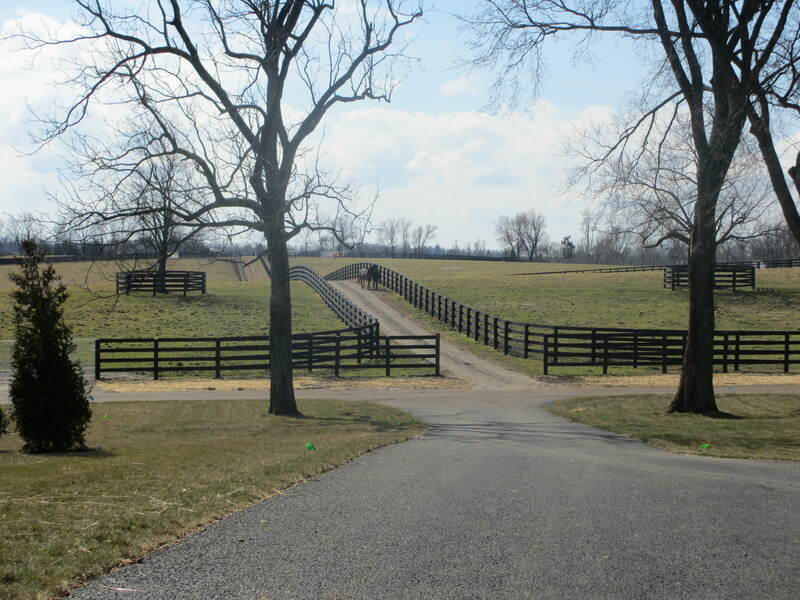 Interesting fact: It costs $6,000 per mile for black fence versus $18,000 per mile for white fence (Kentucky Horse Park has 60 miles of white fence). Wow! This is not an industry for the poor, or even middle income. It can cost $40,000 annually to prep a horse to race and that’s not typically ‘the big league’ like the Kentucky Derby or other Grade 1 races. Some of the farms we visited cost hundreds of thousands to operate per month; some $1 million or more. Our first stop was KatieRich Farms, a 647-acre farm. What did we see that made everyone smile? Babies! KatieRich had welcomed about 40 foals in recent weeks. I thought it was awesome how relaxed the staff was with our tour group, inviting us to the fence to pet the mares and foals. It was evident how well-liked and respected Shaun was by others. One colt was only three days old, wandering his stall while I stared. His bloodline went back to Easy Goer and Alydar, two of my favorite racehorses. I took a picture of him and told Justin we would pay attention for him in 2-3 years when he starts racing. On our way out, we saw one of the mares in the pasture rolling around in the mud. Having just been told the mare cost close to $500,000, I couldn’t help but laugh. These animals don’t care how much they’re worth. In the end, they are animals with basic wants. They care about food, fresh air and a good roll in the dirt! 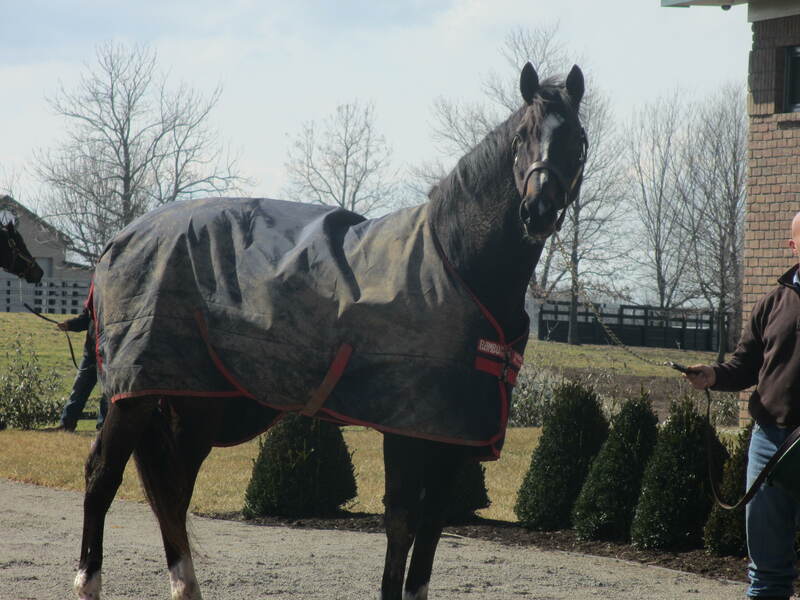 Our next visit was to WinStar Farm. The 1,700-acre farm’s rolling hills go on and on from the road. It’s breathtaking. This stop was true money and amazing horses. Beyond my comprehension. 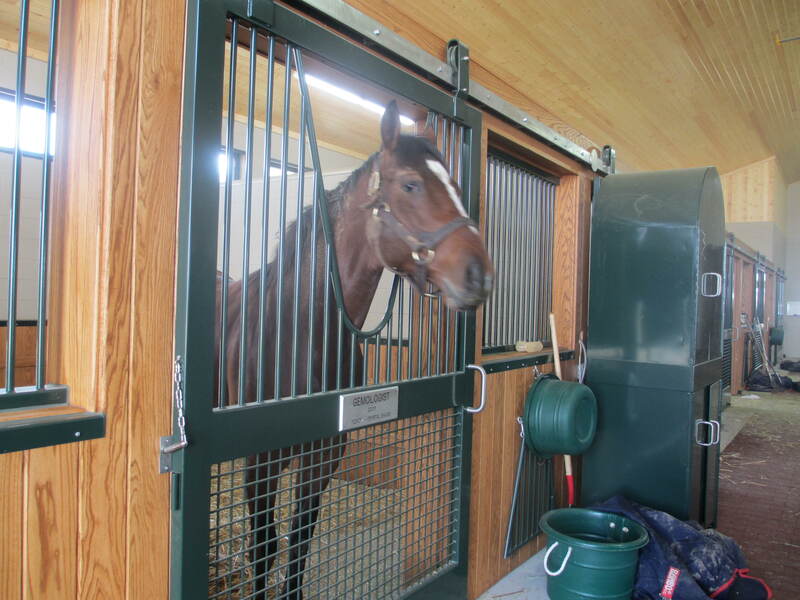 WinStar recently built a new stallion barn so that was our destination. This mammoth, state of the art building had offices, a huge lobby with videos of stallions at stud, three viewing areas for potential breeders to inspect stallions, a lab, washroom for horses, two breeding sheds and more. Breeding shed is a term used in the industry. This was not a ‘shed.’ It’s a padded, well-equipped area to make mating between a stallion and mare as safe and controlled as possible. Remember, these animals are worth lots of money. No random mating allowed. WinStar bred 46 mares the day before! WinStar boasts some pretty impressive stallions at stud – Distorted Humor, Bodemeister, TizNow, Gemologist, More Than Ready and others. Stud fees range from $5,000-$100,000 per insemination. Crazy business! We were fortunate to see Bodemeister and Tiznow up close as someone was there to inspect them for possible breeding to her broodmare. Gemologist greeted me at his stall door. These stallions were breathtaking. Pure muscle, grace and power. Tall, alert and spunky. Watching them prance and then stand tall took my breath away. winners! Established in 1924, Calumet is 832 acres with 22 miles of white fence and was home to Triple Crown winners Whirlaway and Citation, as well as champions Bull Lea and Alydar. While Calumet doesn’t have the brand new, elaborate barns and buildings like WinStar, I love this farm. I love the older style barns and history that fills the stalls and land. We visited the foaling barn, where pregnant mares rest until giving birth. We met one of the women who monitor the mares and oversee the births, ready to step in if help is needed. Also at Calumet is a cemetery of many famous horses, including Alydar and Bull Lea. I like that Calumet respects the accomplishments of these animals to honor them with proper burial and recognition. An exhibit at the International Museum of the Horse at Kentucky Horse Park showcases the history of Calumet, including the hundreds of trophies won by horses representing the farm. A book, “Wild Ride: The Rise and Tragic Fall of Calumet Farm, America’s Premier Racing Dynasty” by Ann Hagerdorn Auerbach follows the great moments of the farm and also the tragedies that led it to bankruptcy. I just purchased the book so am anxious to read it. This was a truly memorable day. I’m grateful to my husband for knowing how much I’d enjoy it. I’m grateful for the opportunity to immerse myself in a world I love and remind myself that, just because I can’t ride, doesn’t mean I can’t enjoy it. Unique Horse Farm Tours tickets can be purchased inside the welcome center at Kentucky Horse Park. Tickets were $35/person for a 3-hour tour. I highly recommend this tour if you have any interest in horses, racing, breeding and/or business operations.